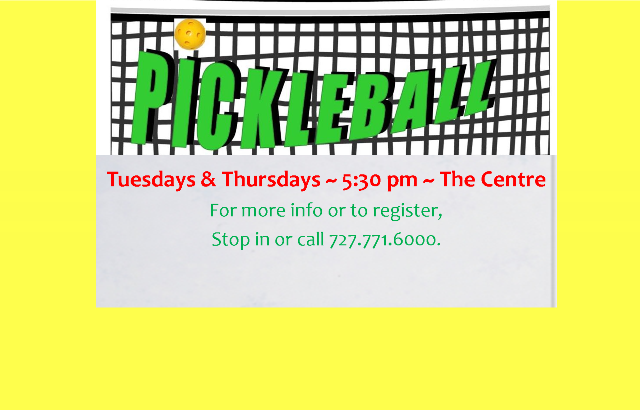 Pickleball every Tuesday, Thursday & Saturday! Pickleball is a racquet sport that combines elements of badminton, tennis, and table tennis. Two, three, or four players use paddles to hit a perforated ball, similar to a wiffle ball, over a net. The sport shares features of other racquet sports, the dimensions and layout of a badminton court, and a net and rules similar to tennis, with a few modifications. Pickleball was invented in the mid 1960s as a children’s backyard pastime but quickly became popular indoor or outdoor sport as a fun game for players of all levels. Come get your pickleball on! For more information or to sign up, stop in or call (727) 771.6000.